On this Memorial Day, here is a view of sailors departing from T-Wharf to return to their ship. I’ve posted other views of sailors arriving and departing — such as this from around 1907 and this also from 1907 — but this view appears to be from the 1930s. The postcard was published by Rockport Photo Bureau. It bears a postmark from Aug. 28, 1940. Charles Cleaves, the owner of Rockport Photo Bureau, died in 1937. Although his daughter, Virginia Cleaves Little, carried on the business for another decade or so, postcards of her photos generally identified her as the photographer. Thus, this was most likely taken by Charles sometime before his death. In the late 1800s and early 1900s, U.S. Navy warships visited Rockport virtually every summer. From what I can tell, however, the annual visits stopped sometime around 1910. Searching news reports, I can find only one reference to a battleship visit to Rockport in the 1930s, and that was in the summer of 1934. For that reason, I am estimating that to be the year this picture was taken. This entry was posted in Uncategorized and tagged Motif No. 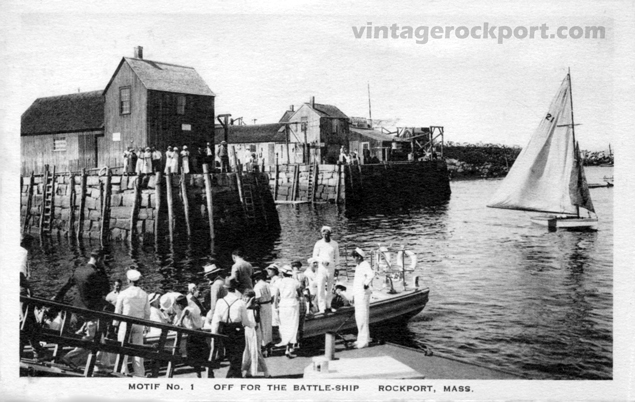 1, Rockport Harbor, Rockport Photo Bureau, Warships. Bookmark the permalink.